This article first appeared in Options, The Edge Malaysia Weekly, on April 3, 2017 - April 09, 2017. Khazanah Research Institute (KRI) managing director Datuk Charon Wardini Mokhzani is famous for his dry sense of humour and predilection for the arts. Anandhi Gopinath speaks to the urbane lawyer turned corporate captain on the journey that led him to KRI’s doors, how research informs policy development as well as the stage production that would change his life. With his impressive shock of white hair and distinguished stature, Datuk Charon Wardini Mokhzani’s profile is unmistakable. 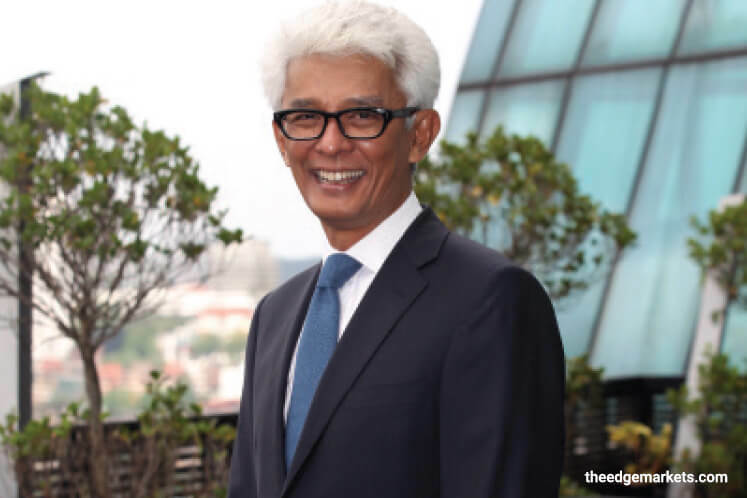 The managing director of Khazanah Research Institute (KRI) is relatively low profile as far as corporate captains go, but it is not hard to pick him out during occasions in which he wants to stand out. He is also quite famous for his passion for acting, and speaks in elegant tones that lay proof to his time spent on the stage. I find Charon to be exceptionally gentlemanly and sweet, if not a little bit reserved, so talking about work is an easier way to start our conversation. I am eager to find out what KRI does and how the company’s research has affected policy change. Behind the dark-rimmed glasses, Charon’s eyes light up and he visibly relaxes — this is stuff he is quite happy to talk about. Fully funded by Khazanah Nasional Bhd, KRI was established in 2013 to undertake analyses and research on the pressing issues of the nation and, based on that research, provide actionable policy recommendations to improve the well-being of the general population. A respectable corporate man with experience in both law and banking, Charon was the perfect choice to head this new entity. KRI started operations formally in 2014. “We don’t have a mission statement as such. I don’t like things like that, but if you look at our website, we say this about what we do: We are looking at the pressing issues of the nation, and using data-driven analyses to come up with possible solutions that will help the lives of Malaysians. It’s an ambitious project, but what’s the point of doing anything that isn’t?” he explains. KRI’s research is either specially commissioned or based on data collected by the Department of Statistics Malaysia, whose methodologies are highly respected both domestically and internationally. KRI’s research topics are of national interest and range from household income to social mobility. The research — and the resulting publications — are downloadable for free from KRI’s website. “Khazanah has always done research for itself as an investor, so the idea was to split the functions up and have one group of people doing research for Khazanah as well as people doing stuff that’s more of a national interest,” Charon explains. “We hope that the results of the research persuade policy change and present an objective way of looking at things as well as possible ways to solve the problem. papers, so there is much for me to catch up on. reform, and that comes from educated public discourse, which is what the books aim to encourage. When KRI needs to persuade policymakers more directly, it makes its research papers more technical in nature. In essence, there is something for everyone. “Our first book was State of the Household, which was to set one of our big agendas — if you want to look at the well-being of the people, it should be based on household income. GDP (gross domestic product) is a great number that says how well the economy as a whole is doing, but it says nothing about how the people are doing. It (the book) seems to have worked — there is now more talk about people’s economy and raising household incomes, and we’d like to think we are part of that,” says Charon. Published research on affordable housing has formed the backbone of a great deal of discussion on the topic of property ownership — why it is so difficult to buy, how prices move up and down, and more recently, whether there is actual value in owning property. Increasingly, young people are looking at putting their money is better-performing and more easily acquired assets — options that were not evident before. KRI’s most recent research project is concerned with social mobility — essentially determining whether the position on the social strata at the point of our birth is the same as when we are adults. The results, even by Charon’s own admission, were quite remarkable. The objective of creating this body of research and information is also to promote informed public debate, which Charon feels strongly about. “I say informed because there’s a lot of debate that goes on, which is complete rubbish because no one knows the facts. Not everyone will agree on what the best solution to a given problem is, which is fine, but you need to know the facts and get into an informed debate,” he observes. What KRI suffers from is a visibility problem — the information is there for anyone to access for free, yet not enough people know about it. “This is the thing. People don’t like to read anymore, and I don’t mean just in Malaysia. But the good thing is that every time we launch something, we get lots of hits on the websites and lots of downloads. That’s quite reasonable. Plus, we distribute our books nationwide. But yes, getting people to know about these books is a challenge — we don’t have Twitter or Facebook yet, although I do know our research material is being circulated on social media. We’re not very good at condensing what we want to say in one sentence,” he laughs. A social media presence for KRI — something we can look forward to soon, perhaps? Charon and I are seated in the same cavernous meeting room where I once interviewed his wife, lawyer turned composer Datin Saidah Rastam, on her book, Rosalie and Other Love Songs — a delightfully- assembled historical account of the development of music in Malaysia. A Midsummer Night’s Dream. It’s very sweet and very true,” he says, grinning widely. Clearly, this is an anecdote he enjoys telling. They are beautifully suited. Besides a shared passion for the law and the arts, they both have a calm temperament and a dry sense of humour. In Rosalie and Other Love Songs, Saidah pens a most poetic tribute to Charon, calling him “a fellow voyager” who unwittingly found himself on this journey of a lifetime with her. Storyteller, one of Saidah’s operas, with Jit. “I really like the theatre and the act of imagining yourself to be someone else. I balanced both work and theatre quite well — when I was doing all those corporate deals, I’d sometimes have to leave early because I had to go for rehearsals,” he quips. Despite his love for the arts, Charon never quite had artistic ambitions as a young man. It was watching Barry Newman’s portrayal of American-Italian lawyer Tony Petrocelli on television that impacted the young Charon. After doing his degree in politics, philosophy and economics in the UK, he read law and came back to Malaysia as a practising lawyer. Theatre was something he dabbled in on the side, as the student theatre groups at Oxford University were quite active. “Unfortunately, theatre doesn’t pay the rent, although things are much better now. In my time, you could never rely on acting or theatre alone,” he says. “I’d like to get back into the arts, but I’m not sure in what shape or form. Charon has benefited from a rich and varied corporate career that has seen him rise through the ranks at several notable organisations. After paying his dues as a lawyer at Shearn Delamore and a stint with Rashid Hussain Securities, Charon went to work at Zaid Ibrahim & Co. As founder Datuk Zaid Ibrahim handled less and less of the day-to-day activities, Charon was promoted to managing director. During his 10 years with the company, ZICO managed to break into a market controlled by the three big firms, whose history dates back to colonial times. One of his clients at ZICO was CIMB Group, and when Datuk Seri Nazir Razak invited Charon to join him, that was the start of his career in investment banking. Ten years later, he was handpicked to join KRI and he made the switch from the glitzy world of finance to that of staid research. “I was very lucky to have worked with really talented leaders in their respective fields,” Charon muses. The avid Arsenal fan — an obsession that has caused him much heartbreak this season, he admits — does not get a lot of time off. And the downtime that should be spent doing productive things like reading is often spent in front of the television. Because, he says with a grin, “on-demand television is a dangerous and terrible thing”. Charon is probably best known for the hours he has clocked up at KRI, as well as the breadth and quality of the information that it is responsible for disseminating. “We wanted to come up with quality work that makes an impact; we didn’t have quantitative objectives. Quality and impact are subjective measures, but you can tell if you’ve made an impact. The fact that our work has been quoted a lot in public debate is heartening,” he says. I find my initial perception to be correct — Charon is indeed a kind and thoughtful leader who recognises the value of the people who work with him. This is no jaded boss tired of the idiosyncrasies of a millennial workforce, but a man who is able to see the best in the team he works with.